A few years ago my buddy convinced me to get my motorcycle license and purchase a motorcycle. I believe everyone should at the very least get their motorcycle license. It’s an invaluable skill and will make you a better driver in general. I was trained at Pacific Riding school is Surrey B.C. and they were phenomenal; the way they instructed you to handle a bike and look with your eyes will literally save your life. What is it about motorcycles that people love so much? Maybe it’s the connection one feels while riding- you know that expression “be one one with the bike, or the adrenaline rush you get while speeding past slow moving traffic. I don’t think there is any other type of driving machine that makes you feel more in tuned with it than a motorcycle. After completing training and acquiring my license, it was time to find a set of wheels. I was on a tight budget and since this was my first bike I didn’t want anything fancy. 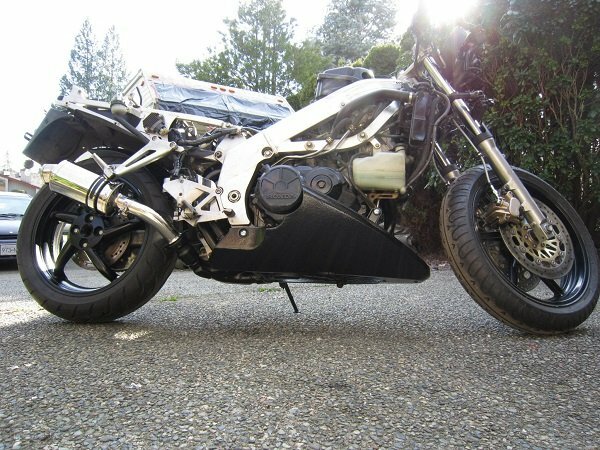 I had no idea what my preference was but I stumbled upon this diamond in the rough, a 1994 Honda VFR750. I’m no motorcycle expert, but I will tell you what I know about this machine. The VFR750 is an amazing overall class of bike. It’s sporty like a sport bike but the foot positioning will make you feel a bit more like you’re on a touring bike. It’s fast by car standards, but a 600cc bike is still much quicker. The VFR750 is stable and comfortable, I wouldn’t call it a light feeling bike, but the police in Japan did use it. The VFR’s strongest suite has to be its construction and the fact it is so over engineered. Half the frame is aluminium, it has a single side arm engineered by ELF, gear driven cams (you’ll probably never see that on a production bike again because it’s so expensive to manufacture) and even the clutch is hydraulic! It’s a great bike to buy used because of how durable it is and how little maintenance it requires. I’m not a huge fan of a pure sport bike, but at the same time I’m not a Harley guy. The VFR was my attempt at developing a muscle bike. I lucked out with the engine type, because with the right exhaust this thing actually sounds like a muscle car. The V4 design is very unique and has the best exhaust note for a motor cycle in my opinion. It just rolls out very smooth and has a relatively deep tone. So the bike received a full stainless steel exhaust system from Delkevic, giving it that raw metal look and having good flow. For an intake I just put a K&N drop in filter and drilled some holes in the front of the air box to help let some more air in. Feel is everything on a bike, so custom stainless steel braided brake lines and clutch line were installed to give a more positive feel when operating the motorcycle. I know nothing about bike suspension and setup, so the bike was sent to RMR suspension in Abbottsford to have the front forks rebuilt with Eibach springs and a mono Penske shock was installed. They tuned the bike for my weight and it felt great after. Acceleration and braking the bike was much more planted and it was a more comfortable ride. As for looks, I wanted to keep it simple and give it a raw metal look. I like showing off the design and engineering of a motorcycle, that’s why a gravitate towards naked bikes. I purchased the bike without fairings so I didn’t mind not making it look factory and cutting stuff up. I have to admit, at highway speeds you want the fairings. Aerodynamics are huge for high speed stability, but if you look cool who cares right? As many aluminium bits were put on the bike to contrast the black paint job, but something was still missing. I purchased red reflective rim tape, to help make the bike more visible at night and also help theme it to the Go Fast have Fun colour scheme. In the end you get a great running bike that looks like nothing else on the road but doesn’t try to re-invent the wheel and compromise its ride-ability or handling. Filed under Motorcycle Reviews, Reviews. RSS 2.0 feed.